SALEM, MA – The Peabody Essex Museum (PEM) presents an exhibition celebrating one of the most influential and inventive Native American artists of the 20th-century, T.C. Cannon (1946-1978, Caddo/Kiowa). T.C. Cannon: At the Edge of America ౼ on view at PEM from March 3 through June 10, 2018 ౼ explores the dynamic creative range and legacy of an artist whose life was cut short at age 31. Through nearly 90 works, including 30 major paintings, works on paper, poetry and musical recordings, Cannon’s distinctive and affecting worldview shines through in this groundbreaking exhibition that is organized by PEM and will tour the country through 2019. This is the first major traveling exhibition of his work since 1990. Deeply personal yet undeniably political, Cannon’s artwork adeptly channels his cultural heritage, experience as a Vietnam War veteran, and the turbulent social and political climate that defined 1960s and ‘70s America. Amid ongoing national and global conversations about ethnic identity, social justice, land rights and cultural appropriation, Cannon’s work continues to engage issues that are as relevant now as they were 50 years ago. 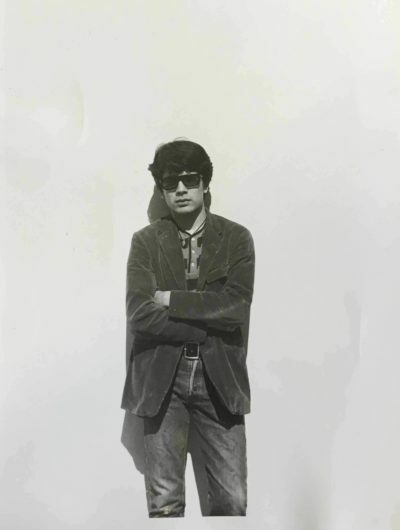 “Never shying from the complexity and nuance of identity politics, Cannon interrogated American history and popular culture through his Native lens and showed us that Native American history and culture are integral to the American experience,” says Karen Kramer, exhibition curator and PEM’s Curator of Native American and Oceanic Art and Culture. Throughout his highly-productive but short career, Cannon fostered a deep intellectual curiosity about the human experience and developed a signature painting style that favored bold color combinations and mash-ups between Native and non-Native elements. In an innovative approach, Cannon fused visual elements from his Native American worldview with European and American artistic influences, such as Vincent van Gogh, Henri Matisse, and Robert Rauschenberg. Cannon’s hybrid visual vocabulary aimed to restore the identity and agency of his sitters, situating his Native subjects within distinct settings, whether contemporary interiors or timeless landscapes. For Cannon, music, poetry and visual art were inseparable. T.C. Cannon: At the Edge of America is the first exhibition to unify the artist’s multiple forms of creative expression on this scale. Cannon’s poetry and country-folk style music offer complex perspectives on his life and art as well as his political activism and fascination with history and culture. Experienced alongside his paintings, Cannon’s written and musical works enhance the visual landscape he so vividly captured on canvas. Taken together, they give us a richer, more multidimensional portrait of an artist whose worldview cannot be neatly or simplistically characterized. PEM has commissioned Choctaw alt-folk musician, Samantha Crain, to write music and perform a song in response to Cannon’s most monumental painting, a 22-foot mural, Epochs in Plains History: Mother Earth, Father Sun, the Children Themselves (1976-77), which was among his last works painted. Tommy Wayne (‘T.C.’) Cannon grew up in a rural farming community in southeastern Oklahoma, raised by his Kiowa father and Caddo mother. America’s cultural revolution was ablaze when Cannon left home in 1964 to begin his journey as an artist at the newly minted experimental arts-based school in Santa Fe, the Institute of American Indian Arts (IAIA), where he began to address and rethink—on the stage of Western art history—the political narratives between Native Americans and the U.S. Government. Two years into his training, Cannon painted Mama and Papa Have the Going Home Shiprock Blues (1966), arguably the most significant of his early works. His aesthetic choices express layered meaning, and an enduring love affair with color and dichotomy. A Navajo man and woman sit together, hybrids of the past and present, wearing their traditional textiles and jewelry, and of-the-moment sunglasses and cigarettes. Now understood as the painting that spurred the revolutionary New Indian Art movement of the 1960s, the work captures Cannon’s place at the crossroads of Native American and American cultures at a time when the definitions of both were up for debate. “Through Cannon’s figurative work, he rejected the accepted, expected representations of Native ritual life and instead chose to surface issues of the brutal traumas wrought by colonialism and power dynamics,” says Kramer. “Concurrently, through his paintings, poetry and music, he also emphasized the ways in which Native Americans persisted and thrived—sometimes in quietly radical everyday ways—in the face of oppression.” As a powerful voice of a restless generation, Cannon’s artwork showed Native people that removal from one’s land doesn’t necessarily erase cultural landscape or eclipse one’s deep abiding love and respect for community. At the height of the counterculture movement, and in the Kiowa warrior cultural tradition, Cannon enlisted in the U.S. Army and spent almost a year in Vietnam in 1968. While Cannon earned two Bronze Star medals for his service in the Tet Offensive as a paratrooper, he was conflicted about the experience. His poetry and letters from this period reveal a disillusioned artist coming to terms with his participation in violence that mirrored America’s colonial past. Vietnam affected not only Cannon’s emotional landscape but his visual expressions of his experience there. In 1972, Cannon had a significant career breakthrough. 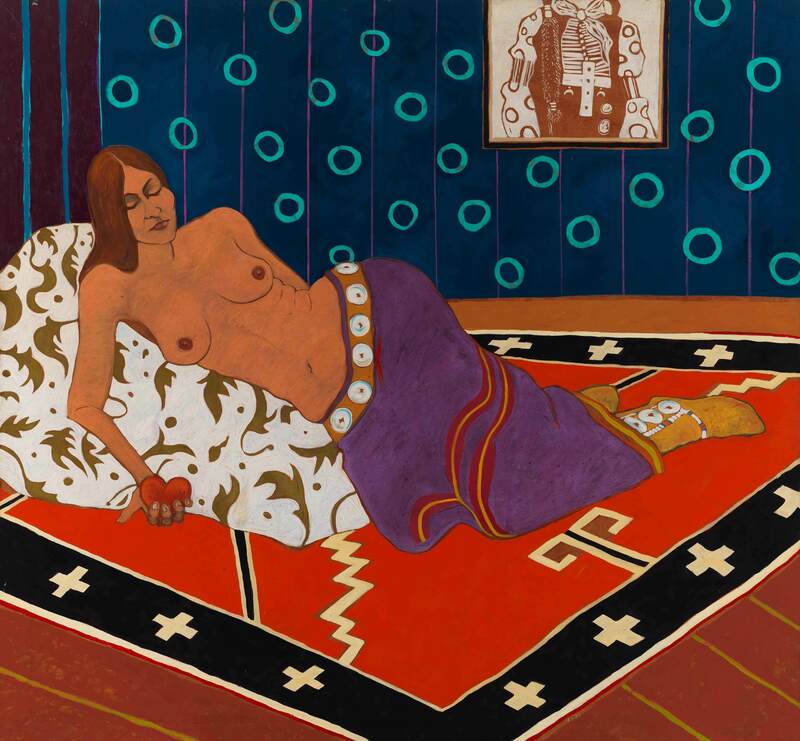 The National Collection of Fine Arts, now the Smithsonian American Art Museum, invited him and his former instructor Fritz Scholder to be in a two-person exhibition, Two American Painters: Fritz Scholder and T.C. Cannon. The exhibition was a landmark success. Jean Aberbach, the owner-dealer of Madison Avenue’s Aberbach Gallery, purchased almost all of Cannon’s canvases off the gallery walls, literally, and signed Cannon with the gallery, who represented him nationally and internationally for the remainder of his life. Two American Painters toured Berlin, Belgrade, Istanbul, Madrid, and London, forging his confidence and propelling him forward in his fusion of iconographic images with complex color symbolism and geometric patterns, where his mythic Indians met modernity, and a political gaze became ever-present. Although he drew and sketched prolifically, Cannon painted no more than 50 major canvases and produced just a handful of exquisite woodblock prints and linocuts, before the car accident that ended his life in 1978. Cannon’s life’s work, as a masterful interpreter of the complex Native American experience, continues to influence artists and other creative spirits. As the boundaries of American art continue to shift and be reconsidered, making room for a more expansive, inclusive vision, a new look at T.C. Cannon’s work is perfectly timed to help redefine what it means to be American. PEM’s Native American art and culture collection is the oldest in the western hemisphere and contains some of the finest works created over the past several centuries. Works from 10,000 years ago to the present cross boundaries of region, period, and medium and emphasize the continuum of creativity that has always characterized Native American art. Through exhibitions, programming, and scholarship, PEM presents Native art and culture in ways that honor the diverse worldviews, ongoing vitality, and creative continuities and expressions of artists and their respective cultures, worldviews, and histories. Please join us for a cocktail reception and exhibition preview of T.C. Cannon: At the Edge of America with curator Karen Kramer. RSVP to Paige Besse at paige_besse@pem.org or 978-542-1646. High-resolution publicity images are available upon request. T. C. Cannon (1946–1978, Caddo/Kiowa), Two Guns Arikara, 1974–77. Acrylic and oil on canvas. Anne Aberbach & Family, Paradise Valley, Arizona. © 2017 Estate of T. C. Cannon. Photo by Thosh Collins. T. C. Cannon (1946–1978, Caddo/Kiowa), Collector #3, 1974. Acrylic and oil on canvas. Private collection. © 2017 Estate of T. C. Cannon. Photo by Tim Nightswander/Imaging4Art. Portrait of T. C. Cannon, about 1965. Courtesy of Archives of the Institute of American Indian Arts. 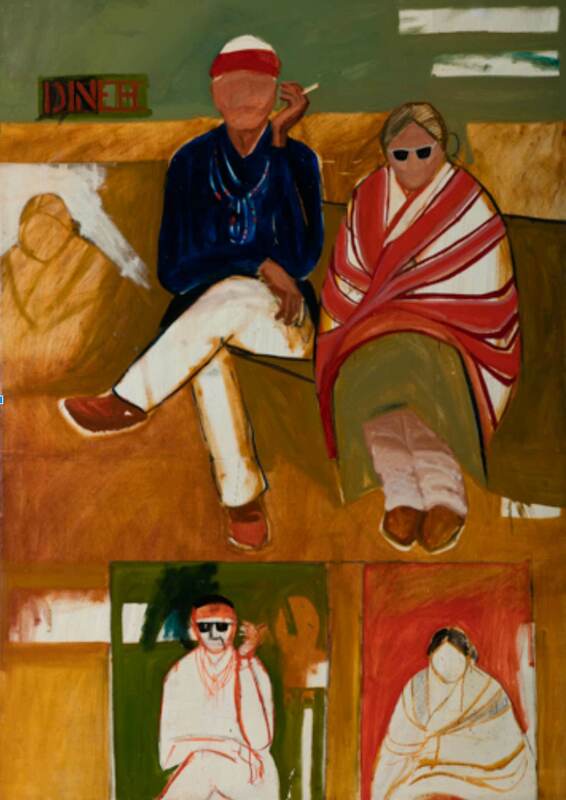 T. C. Cannon (1946–1978, Caddo/Kiowa), Mama and Papa Have the Going Home Shiprock Blues, 1966. Acrylic and oil on canvas. Museum of Contemporary Native Arts, Santa Fe, New Mexico, Honors Collection CD-10. © 2017 Estate of T. C. Cannon. Photo by Addison Doty.